Cockenoe Island is located off Seymour Point in Westport and is only accessible by boat. Cockenoe has a protected lagoon and a salt pond which is home to blue herons and snowy egrets. Proximity to shore has always made it popular for boating, fishing, and picnics. The land originally belonged to the Pequot Indians and apparently a Montauk Indian ,”Cockenoe De Long Island” lived among them. He taught John Elliot, an early missionary to the Indians, the Algonquin language. The word,”cockenoe” meant interpreter and after he returned to Long Island around 1646 he used this word as his name. In 1702 the town of Norwalk took formal possession of the island. In the 1700’s Gershom Burr Smith and his brother began farming the land for corn, beans, and potatoes, and they had some milking cows. Sometimes at low tide the cows would stray over to the smaller islands and when milking time came, Gershom would have to row over to the cows with his buckets. By 1868 farmland was not in demand and the island was spotted by some moonshiners who set up a still. At low tide oxcarts would bring out barrels of molasses and return to the mainland with barrels of rum. This operation thrived during prohibition in the 1920’s until the Federal Government found out, and the Cockenoe Island distillery was raided. In 1967 Westport News editor Jo Fox Brosious successfully led a town wide protest to protect Cockenoe from United Illuminating Company from building a 14-story nuclear power plant. She drew support from all segments of the community and from The New York Times, which published an editorial supporting the town’s campaign to “Save Cockenoe Now”. In 1969 the town of Westport purchased Cockenoe for $200,000, with the majority coming from State and Federal Funds. Many locals have been clamming here since they were young. Sam Bell Jr. learned from his dad, Sam Bell Sr., who learned from his father in the late 1930’s and early 1940’s. Sam Bell Sr. remembers how he rented a boat for $2 a day to go out from Cedar Point to Cockenoe to dig for steamers. There were no anchors then, just a cement block tied to ropes. In the early 1940’s there were no regulations and no permits given. Today, clamming is a year round activity and you can get a map and permit from the Westport Town Hall. 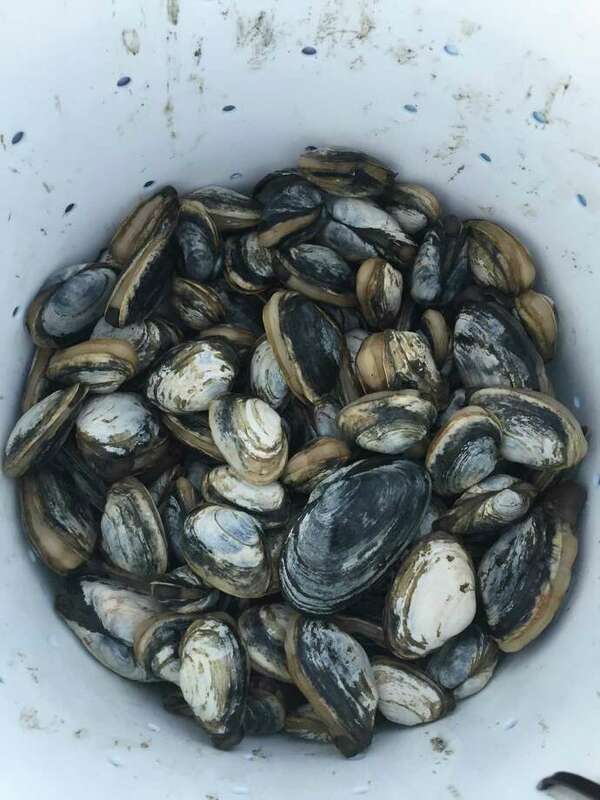 The clam beds are seeded by the town and you can dig for fresh steamers and clams as long as they cannot fit through a small metal O-ring. The clams you take from the sound have to be over one-and -a half inches across.